I’m wrapping up the layout on TwoMorrows’ new book on Vince Colletta this week, and if all goes well on press, it’ll debut at Comic-Con next month. Entitled THE THIN BLACK LINE: PERSPECTIVES ON VINCE COLLETTA, COMICS’ MOST CONTROVERSIAL INKER, it’s a really fascinating look and Vinnie’s life and career, and answers a lot of questions fans have had. His son discusses Colletta’s alleged mafia connections, and a wealth of top pros weigh in on VC’s work, pro and con. 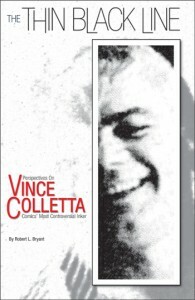 It’s written by Robert L. Bryant Jr., who spent months researching Vinnie’s history, family, and friends both in and outside of comics. It’s one of the most fascinating life stories I’ve ever published, about an inker whose inking I pretty universally despised over Kirby. But like him or hate him, he was quite a character, with an amazingly colorful life. Really a fun read for me, as a big Kirby fan, and I think it’ll be pretty eye-opening for any fan of comics. And don’t worry; I resisted the temptation to leave the last few pages blank to make the Comic-Con release, in honor of Vinnie’s own solution to all the last minute deadlines he was constantly handed. This entry was posted in TNT on 30 June 2010 by Mr. Morrow.